Two boys and a girl. Guess which one is the bully. Yes, Tattoo is growing into quite the bully. The two boys play calmly with each other and then Tattoo comes sailing through the air, landing on top of them. Tattoo is the one who will grab a sibling by whatever fold of skin she can find anywhere and try to shake it around. Ears are particularly vulnerable. She pulled one of her brothers across the patio by his tail the other day. 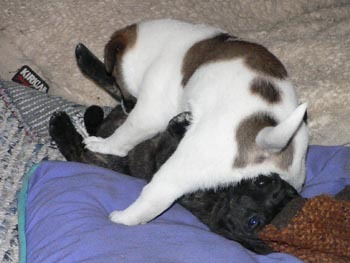 Neither of the boys are quite that aggressive. I love having summer puppies. 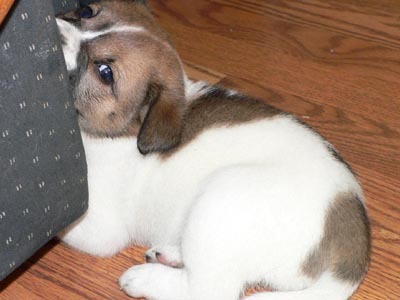 Winter puppies are stuck inside much of the time because of wet or cold weather. Summer puppies can play outside all the time -- and enjoy it. I make their breakfast in the morning, as they all gather around my ankles nipping at them. Then I say "OK--let's go eat" and all three of them gallop either ahead of or along side me to the back door. 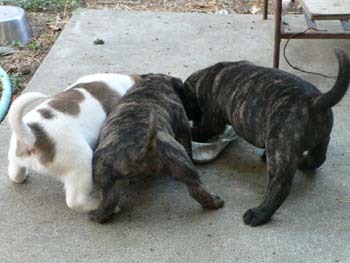 They all gather around the bowl and finish every single bit, tails going a mile a minute as they eat. While they are eating, I close the back door so Sheila and Lizzie can eat and I don't have to worry about them nipping the puppies. By now the puppies are used to being locked outside, so they wander off around the back yard for, if I'm lucky, up to half an hour. Sooner or later they show up at the door and beg to be let in. Lord help me, but Tattoo is starting to leap at the door, the way Lizzie does. She barely gets off the ground right now, of course, but she's definitely jumping. Lizzie seems to be trying to teach them about the dog door, going in and out and then poking her head out to see if they were following her. I think (read: hope) they are too short yet to make it in, but their legs are growing longer every day and it's only a matter of time. No question who will be the first — Goro is too fat, Sopa is too timid. It will be Tattoo.